The cracks running through the crumbling regime of Muammar Gaddafi have shed some fresh light on the fate of Musa Sadr, a popular and influential Lebanese Shi'ite cleric who mysteriously vanished while on a trip to Libya 33 years ago. Abdel-Monem al-Houni, a former colonel in the Libyan army who participated in the 1969 coup that brought Gaddafi to power, has broken a three-decade silence to declare that Sadr was shot and killed on the orders of the Libyan leader. At the same time, however, other reports emanating from the turmoil of Libya suggest that the cleric may actually still be alive, languishing out of sight in a prison for more than 30 years. Sadr, known to his followers by the honorific Imam Musa, was a tall, charismatic, Iranian-born cleric who moved to Lebanon in the late 1950s and helped mobilize Lebanon's traditionally marginalized and downtrodden Shi'ite community. At the time, most Lebanese Shi'ites were beholden to a handful of powerful feudalistic landowners and were poorly represented in Lebanon's sectarian power-sharing system. Sadr quickly set about establishing vocational centers, orphanages and Islamic institutes and lobbied the government for a more equitable distribution of the state's resources. "It was Imam Sadr that woke up the sleeping giant that is the Shi'ites of Lebanon," says Aql Hamiyah, who in the 1980s was the military commander of the Amal Movement founded by Sadr. With his Persian-accented Arabic, striking physical appearance and unflagging energy, Sadr earned respect across the sectarian divide. He even took to preaching in Christian churches, to the initial outrage of the more conservative members of the Shi'ite clergy. Abdullah Yazbek, an adviser to Sadr, recalls accompanying Sadr to a Christian village in southern Lebanon where the cleric was due to speak. When the Christian congregation spotted him in the church, they began chanting, "Allahu akbar," or "God is great," a traditional Muslim invocation. Says Yazbek: "The way people treated him, it was as if he was Jesus Christ." In the 1970s, Sadr found himself increasingly at odds with the Palestinian factions that had taken over southern Lebanon from where they launched attacks into Israel. The residents of southern Lebanon, including Sadr's Shi'ite constituents, inevitably bore the brunt of Israel's retaliation. Then, in August 1978, Sadr traveled to Libya with two companions, apparently hoping to persuade Gaddafi to use his influence to curb the Palestinians in Lebanon. (The relationship between the two men had never been good: according to Fouad Ajami's The Vanished Imam, the Libyan strongman brought a 1975 meeting with Sadr to an end by pretending to fall asleep.) The imam was last seen in public on Aug. 31, 1978, shortly before his scheduled meeting with Gaddafi. Days later, in response to requests from Sadr's anxious followers for information on his whereabouts, Libyan authorities claimed that the Lebanese cleric and his two colleagues had caught a flight to Rome. But Italian authorities said the three men were never on board the plane. Ajami's book cites U.S. diplomatic cables indicating that Sadr may have been killed when a heated discussion between him and Libyan officials inadvertently came to blows, the cleric receiving a fatal one. But the Libyans never confirmed anything, and Gaddafi remained perpetually enigmatic about it  even after a delegation of 200,000 Lebanese Shi'ites traveled to Syria to plead with him for information about their beloved leader. Reminded of the Arab tradition of hospitality and that Sadr had been his guest in Tripoli, Gaddafi reportedly said, "I am told that Musa Sadr is an Iranian, is he not?"  indicating that the Arab custom did not extend to foreigners. For many Lebanese Shi'ites, Sadr's mysterious exit evoked comparisons with the "hidden imam," a messianic spiritual leader who vanished in the ninth century and whose return, the majority of Shi'ites believe, will herald the end of the world and their salvation. 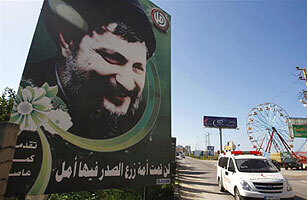 Even today, Sadr remains a revered figure to Hizballah, the powerful Shi'ite militia, and to other Lebanese Shi'ites. Sadr's disappearance caused a rift between Lebanon and the Gaddafi regime that has never healed. Hamiyah, the Amal commander, staged an incredible six hijackings of Middle Eastern airliners in the years that followed in a vain attempt to pressure Libya into revealing the truth about Sadr. In an interview several months ago, the burly, thickly bearded former militia commander wept openly when discussing his mentor's fate. "This brings great sadness to my heart," he said. "I am willing to sacrifice my sons and whole family to hear what happened to him." Motives for Sadr's alleged assassination are plentiful. Some believe Yasser Arafat, the Palestinian leader, colluded with Gaddafi to remove a persistent critic of the Palestinians in southern Lebanon. Others suggest that Ayatullah Ruhollah Khomeini, the leader of the Islamic revolution against the Shah of Iran, regarded Sadr as a potential rival and asked Gaddafi to have him eliminated. Now, as Gaddafi's hold on power looks increasingly frail, might the fate of Musa Sadr actually be confirmed? In an interview with the pan-Arab Al-Hayat daily newspaper on Wednesday, Feb. 23, Houni, who was Libya's representative to the Arab League before joining the uprising, said that Sadr's body was flown in Gaddafi's personal jet to the Libyan city of Sabha, 400 miles (640 km) south of Tripoli, and buried there. Najieddine Yazigi, the pilot (and Houni's brother-in-law), subsequently was murdered to help preserve the secret. "I knew deep in my heart that he was dead, although I never wanted to believe it," said Hamiyah, on being told the news. "I blame Gaddafi, and he must be held accountable for this crime." But the Saudi-owned Asharq al-Awsat newspaper offered a ray of hope, quoting a Libyan dissident, Issa Abdul Majid Mansour, as saying that Sadr was alive in a prison in Sabha. If he is still alive, he would be 82 years old today. If Gaddafi's regime follows those of Tunisia and Egypt in the coming days, one can only wonder what other hidden secrets of the ruthless, flamboyant and eccentric Libyan leader's 42 years in power may yet be revealed. See "Europe Hails the Arab Protests but Fears a Flood of Migrants."